Few times in life do you come across a product so helpful and so budget-friendly that you just need to have one in every room...for every thing. That's exactly how we felt when we first saw the 3-Tier Rolling Cart. The design itself is simple and straightforward; durable construction, three shelves and rolling wheels to make it mobile - that's where we came in. 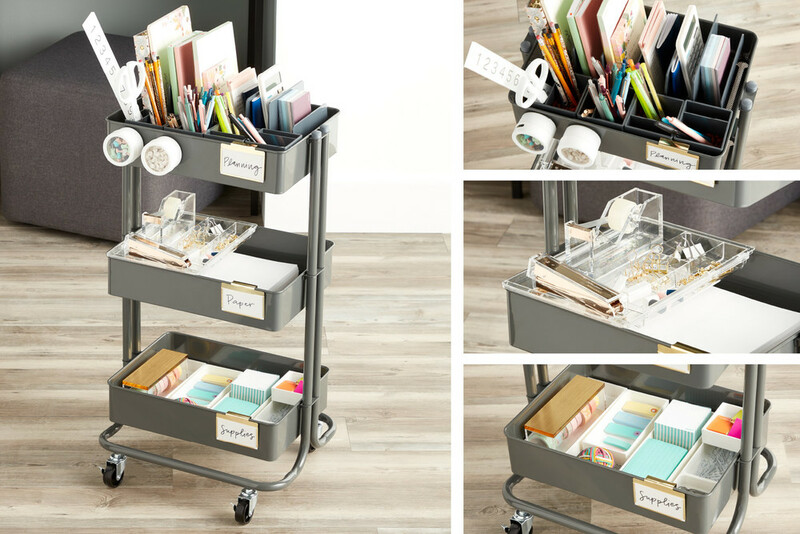 Since we like to find even more ways to amplify organization, we saw the versatility of this cart and decided to put together 7 premade starter kits tailored for each room you might wish to use them in. Check them out and learn a little more about which is right for you, below! 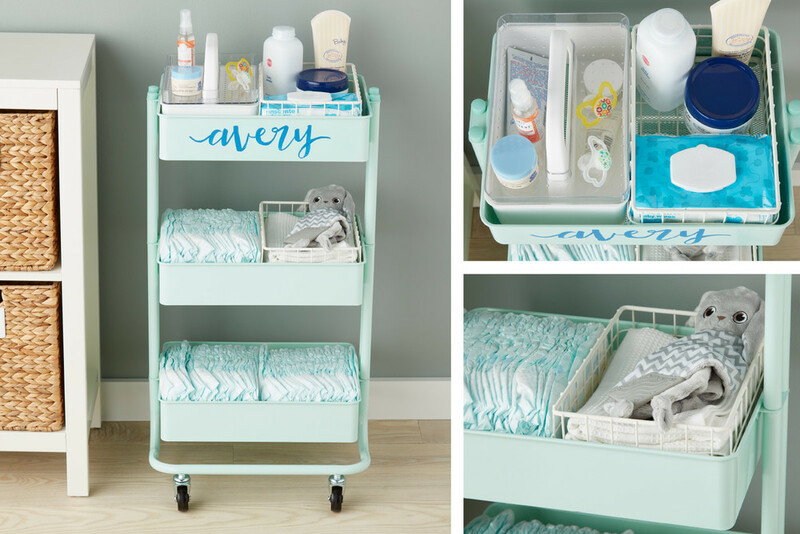 If you're looking for an easy answer to adaptable nursery organization, this Nursery Storage Cart & Accessories Starter Kit is for you. Organize burping cloths, baby wipes and creams with the help of our madesmart Stacking Caddy and Small Stacking Wire Basket. The rest of the tiers can be used to store diapers...and more diapers. Laundry rooms are notoriously lacking in storage. You may have a few cabinets and a hanging rod, but rarely is it enough to actually store everything you need to do the task. 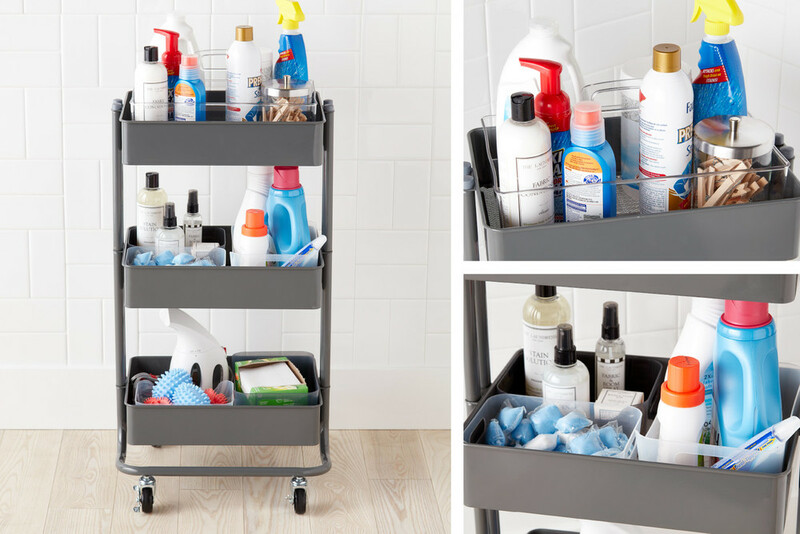 Our Laundry & Cleaning Storage Cart & Accessories Starter Kit has the power to corral all your washing, drying and steaming supplies. With the help of adhesive labels, you can create a permanent place for what you store, while handled storage bins and open organizers allow you to separate clips, dryer balls and your smaller bottles. Gone are the days of needed a big desk with big drawers - taking up that amount of space for an office just doesn't make sense anymore. 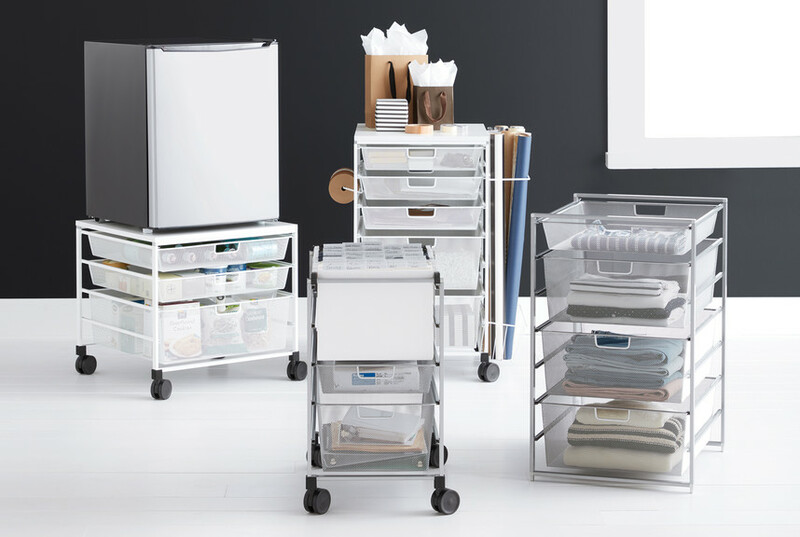 Look to our Office Storage Cart & Accessories Starter Kit to solve all your storage woes. 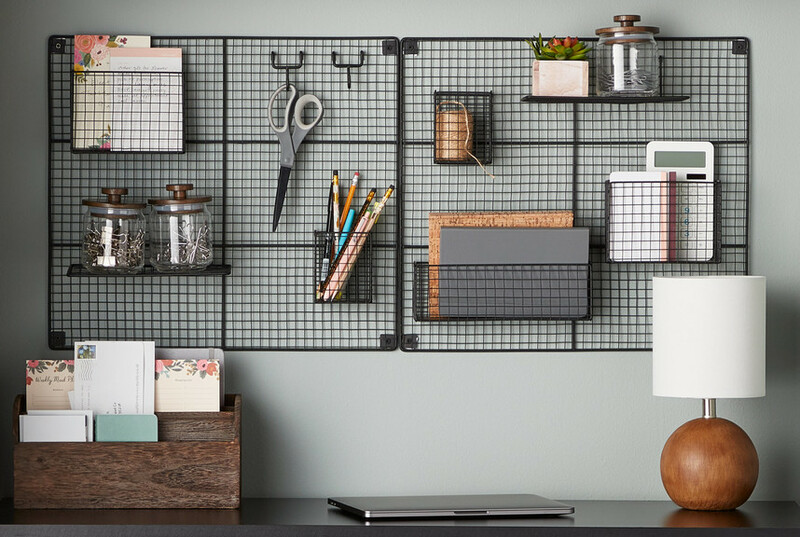 Our Poppin Desktop Collection has been configured to fit perfectly within each tier, allowing you to organize papers, notes, office accessories and other nick-nacks. Super clear drawer dividers and magnetic See & Store Containers allow you to sort and keep-handy all of your paper clips, push-pins, binder clips and more. Craft storage has often been an abstract concept. 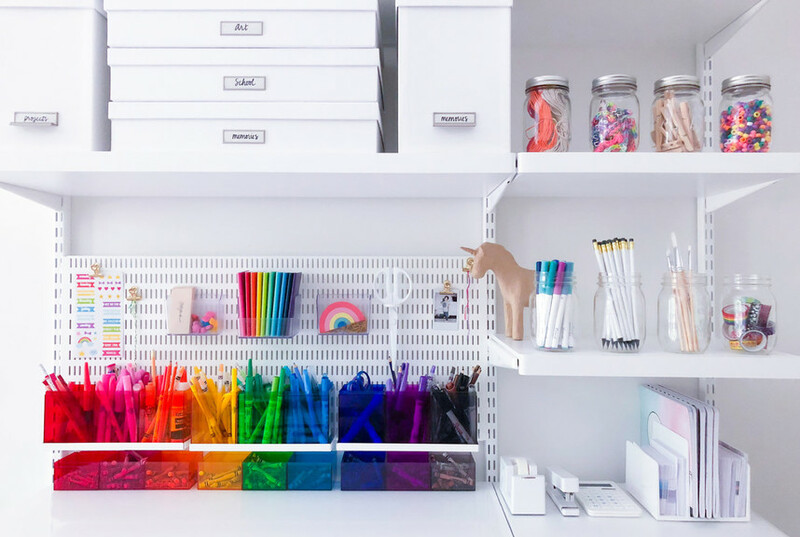 Since so many crafts are sized differently than basic papers, pens and office supplies, there aren't many options for stylish and workable storage. But with our Arts & Crafts Storage Cart & Accessories Starter Kit there finally can be. Creative labels adhered to the front of each tier can identify exactly what you want to store where, while our minimalist Smart Store Inserts can help you organize by color, size, solution - whatever to your heart's content! 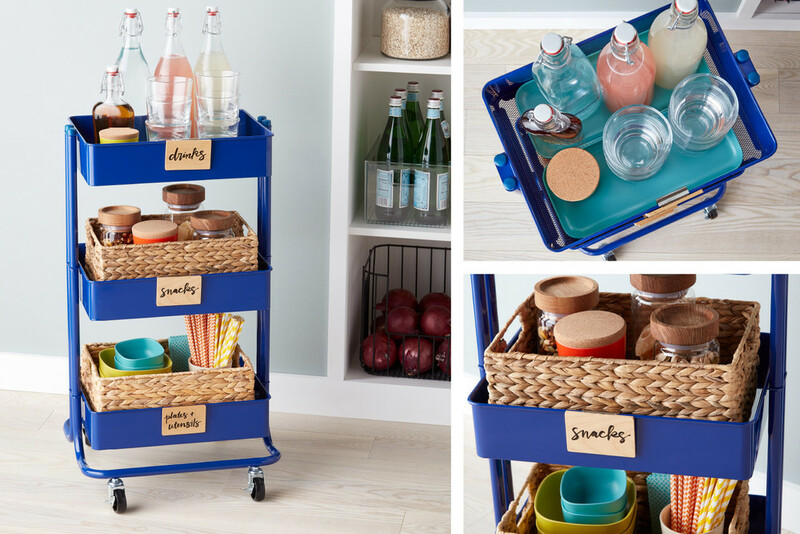 If you're the kind of entertaining that likes to move around the room, our Entertaining Storage Cart & Accessories Starter Kit is perfect for you. Add a touch of style to your mobile serving cart with our Hyacinth Bins, Glass Canisters with Oak Lids and eco-friendly Bamboo Bowls and Cups. Birch labels tie the entire look together for a serving cart that can truly go anywhere. 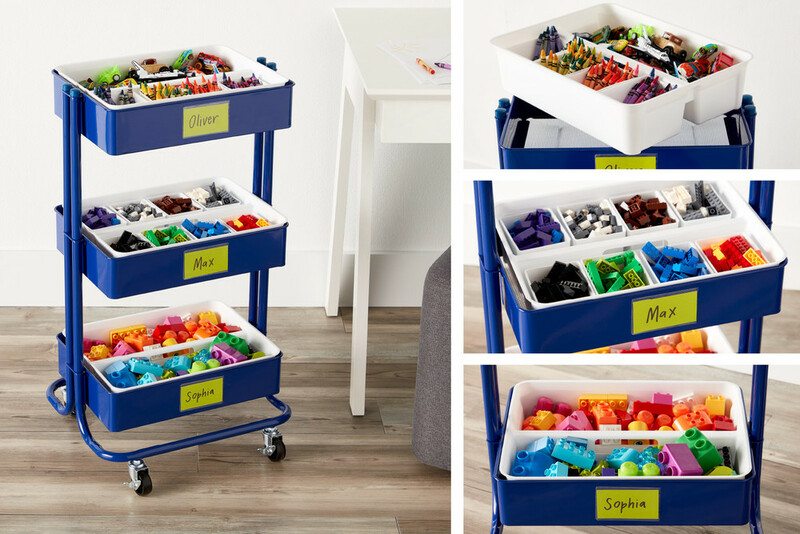 More than just Lego storage, this solution can move with them from room to room. 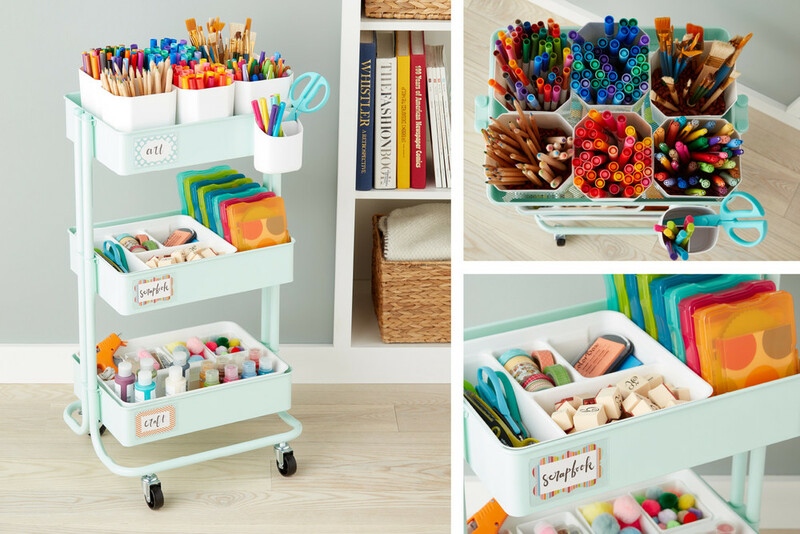 Our Kids' Craft & Toy Storage Cart & Accessories Starter Kit can organize even the smallest of playtime wonders. 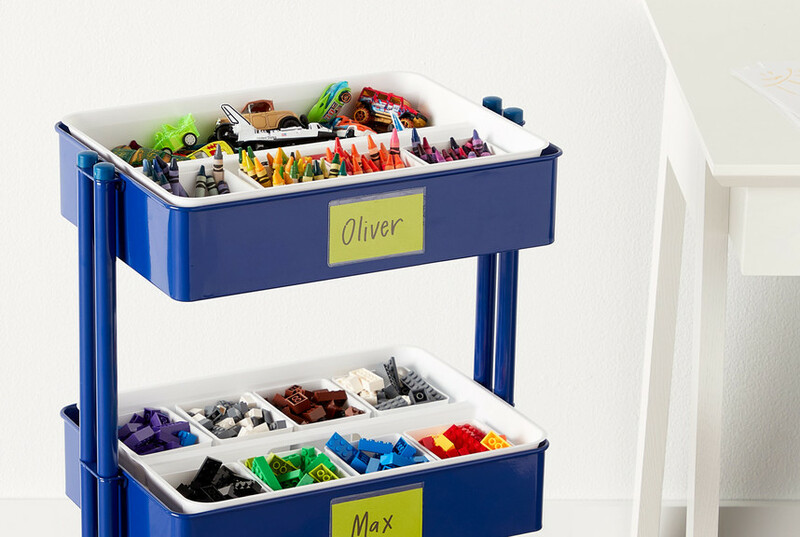 Thanks to our Smart Store Handled Trays and Inserts, you can accommodate an entire collection of legos, figurines or any small toys. 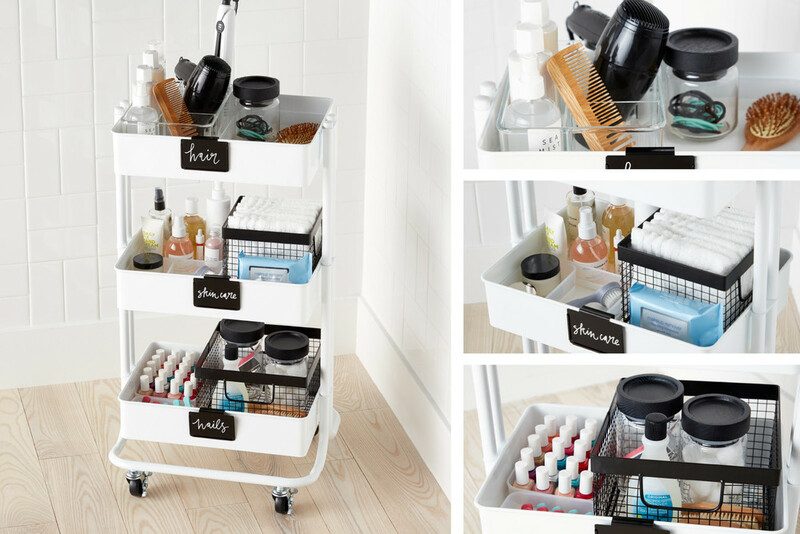 If you're limited on bathroom cabinet space or counter space, our Toiletries Storage Cart & Accessories Starter Kit can be your mobile companion. Grid Bins and Canisters with Black Lids give this solution a nice color contrast and major storage power for hair accessories, makeup, and bathroom essentials. Chalkboard Labels give it a beautiful finishing touch. 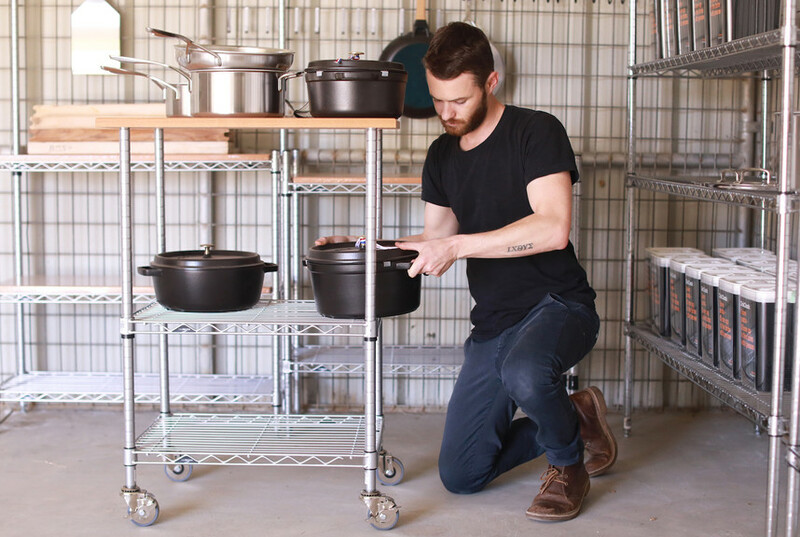 Shop all of our Starter Kits here, and tell us what you're hoping to use your 3-Tier Cart for in the comments below!